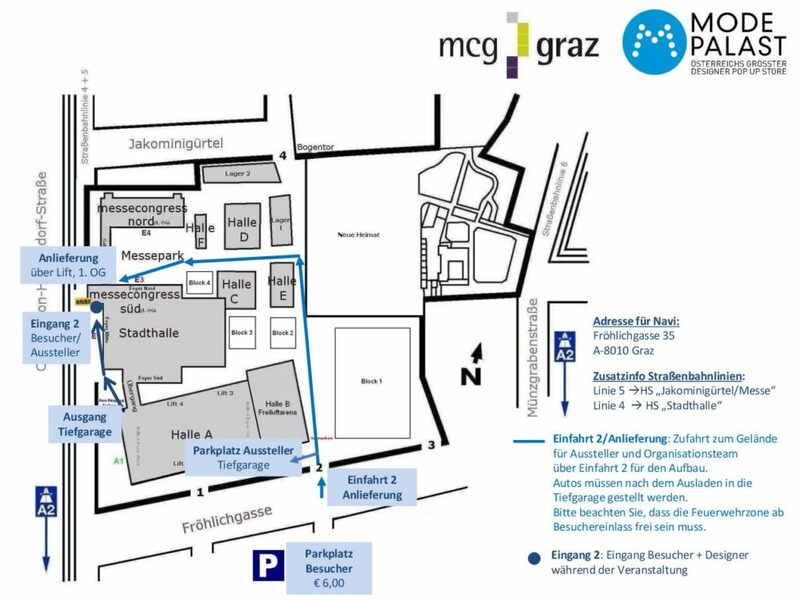 This page provides designer information for MODEPALAST Graz 2017. Prior to the event we will provide you with a PDF with all relevant information! We are looking forward to a great MODEPALAST 2017! We need your help to push our MODEPALAST facebook page! Each facebook friend is a potential visitor and buyer! Please make sure to like our fanpage and invite your friends to do the same! Due to competitive exclusion reasons with our official MODEPALAST sponsors it is NOT allowed to present or distribute ANY commercial or advertising spam of any third party at all, not even at your own booth. Please take that seriously, it will be checked! We kindly ask all of you not to apply any SALE signs, neither on your stands nor on your collections. It is not allowed to fix anything on the walls. treated sample at hand. In case of an inspection this sample may possibly be lit in order to check if the material used has been treated. Thus, your decoration material must be able to pass a fire test on the spot, i.e. it must not burn and on no account drip off burning. The architecture of MODEPALAST and all of the designer’s booths are predefined. It is possible to bring your own table, sittingpossibility, decoration objects, mirrors, storage and mannequins but NO additional clothes racks, and banners! All rooms have daylight, and a good lighting situation. Multiple changing rooms and mirrors are available in each room. Take driveway 2 for delivery. Afterwards take the underground carpark – you will get a ticket which is for all days and for FREE at the EXHIBITOR INFO-DESK. There is an EXHIBITOR INFO-DESK. Each label has to get their Exhibitor Bands before setting up. Then bring your products to the booth and park the car befor setting up. Thank you. There are FREE parking possibilities directly at the venue specifically for MODEPALAST Exhibitors. The Exhibitor Tickets are not transferable. You get them at the EXHIBITOR INFO-DESK. We have no MODEPALAST EC-Cash service. You can bring your own EC-Cash Service. There is a EC-Cash machine at the entrance. During the night the rooms are closed. Yet, the exhibits are not covered by insurance. We recommend arranging exhibition insurance with your own insurance company. On Saturday, after opening hours we invite you to a get together with a few drinks. There are no free customer tickets. Therefore the entrance fee is very low – 5 EUR. If there is a possibility that we get free tickets – we will inform you at the EXHIBITOR-INFO-DESK. No booth shall be cleared prior to the end of the exhibition. Clearance shall take place within the agreed time of clearance. Designers are responsible for waste disposal at their booths and for the cleanliness of their booths (floor as well as tables). The disposal of packaging material, waste/trash and other objects left behind will be, dependent on effort, charged with not less than EUR 50,00 excl. VAT and will be sent as an invoice to the exhibitor after the exhibition/fair.